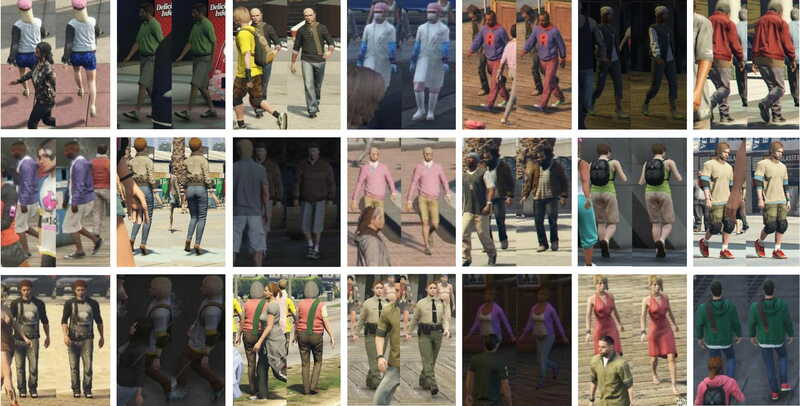 AiC (Attributes in Crowd) is a novel synthetic dataset for people attribute recognition in presence of strong occlusions created by exploiting the highly photorealistic video game Grand Theft Auto V developed by Rockstar North. It features 125,000 samples, all being a unique person, each of which is automatically labeled with information concerning visual attributes, as well as joint locations. With this email we declare that we will use the AiC Dataset for research and educational purposes only, since we are aware that commercial use is prohibited. We also undertake to purchase a copy of Grand Theft Auto V.
We will promptly reply with a download link and a detailed description of the structure of the provided annotations. You can find the GitHub repository here. The work is supported by the Italian MIUR, Ministry of Education, Universities and Research, under the project COSMOS PRIN 2015 programme 201548C5NT. We also gratefully acknowledge the support of Panasonic Silicon Valley Lab and Facebook AI Research with the donation of the GPUs used for this research. We believe in open research and we are happy if you find this data useful. If you use it, please cite our works  .